Alright all you movie buffs! 5 days and counting till the Oscars! Here are some fun and easy recipes for you to make for your Oscars party! You can make these babies as big or small as you'd like. For the lazy folks who don't want to make tiny mouth size hors d'oeuvres, I've made them a little bigger and it'll be easier and faster to make and plate! Watch the segment...here's the link! Two types of Gougères (French Cheese Puffs). A traditional one made with Gruyere cheese and the other with bacon, cheddar and chives. You can easily pick up this mix from Williams Sonoma and add your own favorite cheeses. I did in fact add a touch of salt and pepper to give it more flavor. 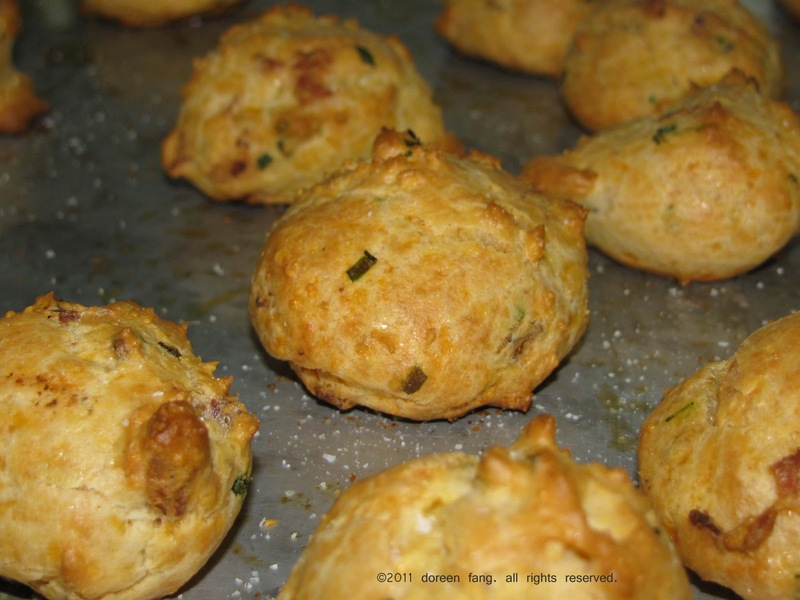 If you are making the traditional gougere with gruyere, I recommend that you use one that is aged for a minimum of 3 years for more flavor. If not, the flavor will get lost and you can't really taste it. 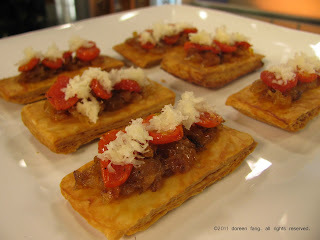 Then, I made a larger appetizer version of some hors d'oeuvres that we usually make in bite size form, which takes less time for people to prepare and less labor intensive. If you want to make smaller bite size pieces, you can use round cutters, squares or any fun shapes you would like. 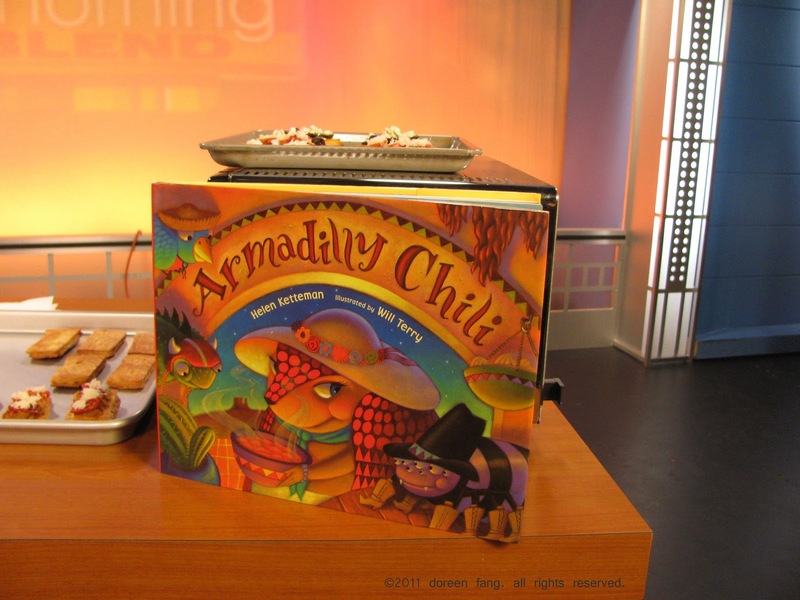 Super excited to be the honorary chair for the California Teacher's Association - Read Across America 2011, reading for national literacy. I'm reading Armadilly Chili by Helen Ketteman! It's Read Across America Day on March 2nd, so pick up your copy, read it with your kids and help support CTA (a non-profit organization). 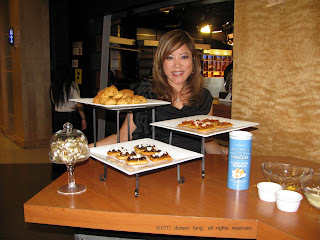 Have a fabulous week and serve up one of these tasty treats for your Oscar party! Position 1 rack in the lower third of an oven and another rack in the upper third. Preheat the oven to 400°F. Lightly grease 2 baking sheets. 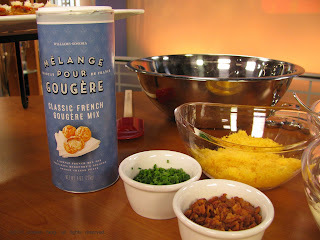 Put the gougère mix in a large bowl and stir in the water until the mixture is smooth. Stir in the cheese until well blended. Let the batter rest for 2 minutes. Drop the batter by the tablespoonful onto the prepared baking sheets, spacing the gougères about 1 inch apart. Bake until the gougères are gold brown and crisp when tapped, 32 to 36 minutes, switching the baking sheets between the oven racks and rotating them 180 degrees halfway through baking. To test for doneness, crack open a gougère; the inside should be airy and slightly moist but not wet. Let the gougères cool on the baking sheets for 5 to 10 minutes, then serve warm. Or let them cool completely and serve and room temperature. Prepare the mix as directed and add the crisp bacon, grated cheddar and minced chives. Let the batter rest for 2 minutes. In a medium sauté pan over medium heat, add butter, melt, then add onions, stirring and coating all the pieces with butter. Stir onions often, but cook slowly till they turn amber brown. Do not burn the onions, especially in the beginning of the cooking process. Caramelized onions will take approximately 1 hour to cook, so stir of often. Once the onions are nice and dark brown, you can let them caramelize and get a dark golden color, but do not allow them to burn. Remove from pan, and set aside to cool. If there is a lot of excess butter, use a paper towel and absorb off the butter. This can be made a day ahead, stored in an airtight container, covered and refrigerated. Preheat oven to 350°. Add the tomatoes in a large bowl, toss with olive oil, salt, black pepper and thyme. On a rimmed sheet pan, lay the slices of tomatoes in a single layer. Roast for 45 minutes, do not let them burn. Remove from oven and cool. You can make this a day before, store in airtight container, cover and refrigerate. Preheat oven to 350°. In a large bowl add the mushrooms, garlic, olive oil, salt, pepper and toss. Combine thoroughly. Put the mushrooms in a 9x13 baking pan and roast the mushrooms for approximately 45 minutes. Note: You can use any type of mushrooms available in your markets, ie: White, cremini, portabello, chanterelle. Preheat oven to 400°. Follow defrosting instructions on package. Once the sheets are thawed, score the puff pastry width wise while still folded in thirds, into approximately 1” pieces, making 7 equal pieces. Cut it through all the way, then open up the 1” sections and cut where the puff pastry was folded. In a small bowl, crack the egg into in and add the 1 Tbsp of water and whisk. Line your sheet pans with parchment paper. Place 21 pieces on one sheet pan, and the other 21 pieces on another sheet pan, then brush with egg wash. Put a piece of parchment on top of the puff pastry rectangles and place another sheet pan on top. Bake for 30 minutes. Half way through, switch the baking sheets between oven racks and rotate them 180 degrees. After the 30 minutes, remove the top sheet pan to allow the puff pastry to brown. Bake for an additional 2-3 minutes until golden brown. Once they are done, remove from oven and allow to cool for 5-10 minutes before removing the parchment paper. Assemble all your tartlets on a sheet pan, put a small teaspoonful of the onions on the tartlet, flatten, add about 4-5 slices of tomatoes, sprinkle with Monterey Jack cheese and bake off till heated and cheese is melted. 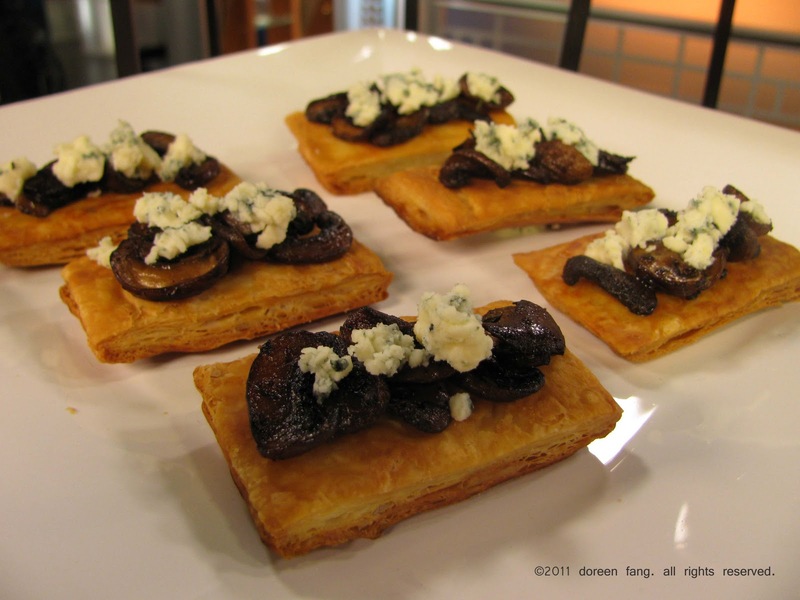 Assemble all your tartlets on a sheet pan, put a small teaspoonful of the mushrooms on the tartlet, flatten, add a sprinkling of the crumbled blue cheese and bake up till heated and cheese is slightly melted.